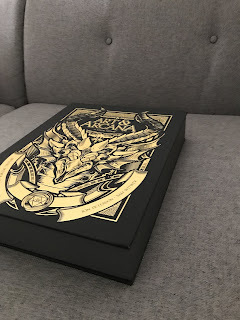 I received my copy of the Dungeons & Dragons Art & Arcana Deluxe Set in the mail yesterday, and while I've only had a few brief minutes to peruse it so far, my first impression is very positive - that this is a substantial and very interesting book that does everything the previous D&D art books (from 1986, 1989, and 2004) did not. 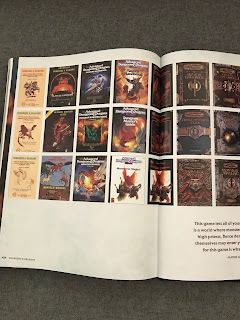 While the focus is on the "visual history" of the game, they've taken a much more expansive view of that concept than the previous books, including not only art from the rulebooks and modules, but also extensive discussion and examples of things like logos, trade dress, maps, advertisements, etc. The book is arranged in chronological order, from the earliest days of Chainmail and the Castle & Crusade Society up through the latest D&D 5th Edition releases, but there are sidebars interspersed throughout - on topics like the evolution of mapping and how different characters and monsters have been depicted throughout the years - that keep the "early edition" content that I'm interested in present throughout pretty much the entire book. I haven't actually read any of the text (aside from some photo captions) yet, but from flipping through the book there is a ton of stuff of historical and nostalgic interest, not just reproductions of art (cover and interior) and old ads and pictures of oddball 80s-era licensed products, but really cool unpublished tidbits as well. 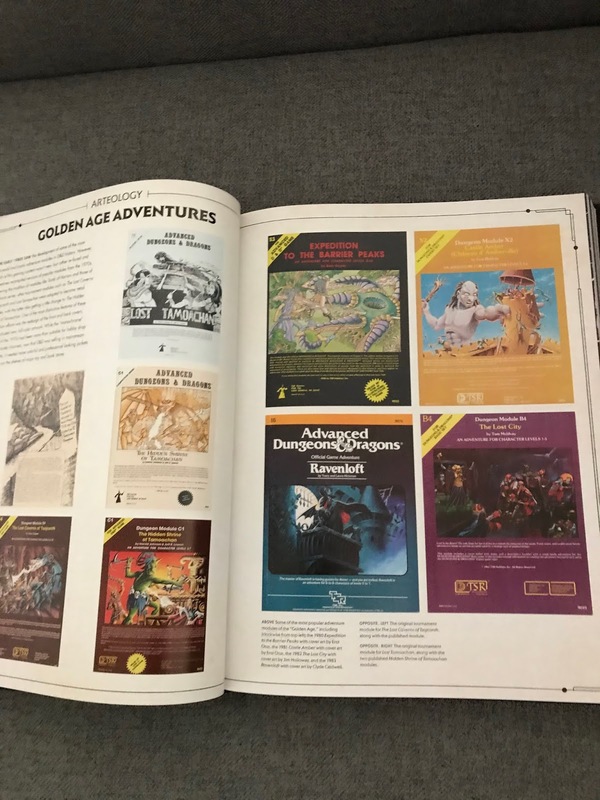 Some of this is stuff that people who follow historically-oriented D&D blogs (like Playing at the World) and ebay auctions (like those from The Collector's Trove) will already have seen - like Gary Gygax's original "Great Kingdom" map that eventually became The World of Greyhawk, and pre-publication versions of some of the famous TSR cover art, but there's also stuff that is new (or at least new to me), such as Gary's hand-drawn maps of the village of Hommlet and the upper works of the Temple of Elemental Evil from his 1976 home campaign, that are intriguingly different from what was later published by TSR (Hommlet is the same but smaller - the "main street" around the Inn of the Welcome Wench is exactly the same, but many of the outlying buildings - the church, the jeweler, the brewer, and the tower - aren't present; while the Temple upper-works are almost completely different). 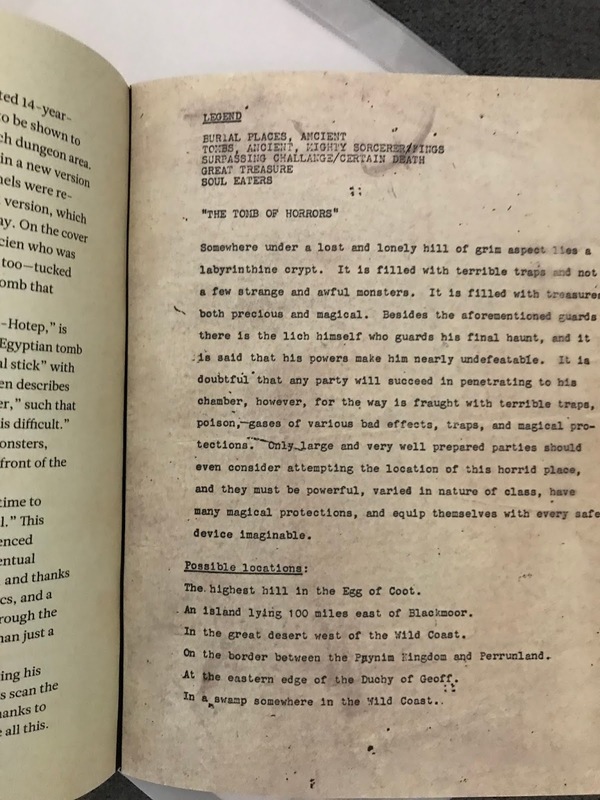 The book is over 400 pages long, and I've only looked through a small portion of it (I confess I got so distracted by studying the TOEE maps that I didn't really look much further after that) so there may well be more surprises of that nature that I haven't spotted yet. It's worth mentioning that (again, in contrast to the earlier D&D art books) this book is very solidly and well-produced. It is heavy. The paper is thick and glossy and all of the reproductions are very clear - many of them looking better than their original appearances. This feels like something you'd get in a museum store, and justifies its high pricetag. An even higher price (which, of course, I paid) gets you the "deluxe edition" which includes not only the book with a special matte cover, but comes in a box (with the same cover art) that also includes a pouch of extra swag - loose prints of various key pieces of D&D art through the ages (text-free versions of the cover art of the AD&D Players Handbook and Fiend Folio, Dave Trampier's glorious art from the original AD&D Dungeon Master Screen, and various pieces of later-edition art) that are theoretically suitable for framing, though the larger ones are folded and have visible creases, and most intriguingly a reproduction of the original 1975 tournament version of Gary Gygax's Tomb of Horrors. This is a typescript of a dozen or so pages, a hand-drawn map, and 20 or so illustrations, just like the 1978 module version (but the art is by Tracy Lesch rather than Trampier and Sutherland, so it's of considerably lower quality). The map and at least most of the encounters appear to be the same (though even in a very brief skim-through I spotted at least one or two differences). 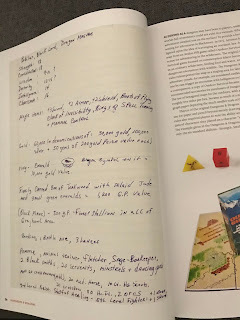 The summer of 1975 is very early in D&D's history, long before TSR became a professionalized operation, but it's interesting how much of what later became the standard for TSR's modules is already fully formed here - the only real difference between this version and the 1978 version is the production values of the art and map and the typesetting of the text. 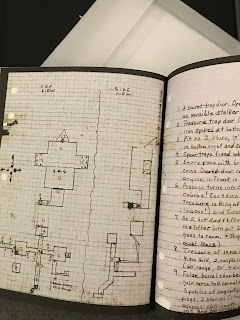 And, as a bonus to the bonus, and even more intriguing, the TOH booklet also includes a reproduction of a short dungeon (5 hand-written pages and one map covering 14 rooms) that D&D fan Alan Lucien sent to Gary and that inspired him to create the Tomb of Horrors - the "Tomb of Ra-Hotep." As the name suggests, and which has gone curiously un-commented-on that I've seen in a brief scan of other previews and reviews of this book (and the introduction within the book itself) is that Lucien's dungeon seems to have been a very close and direct inspiration not just for the TOH, but for Gary's later expansion of the same concept as Necropolis: The Tomb of Rahotep. Not only is the villain's name the same, but so is the map and many of the traps and encounters! Lucien was acknowledged with (presumably non-royalty-bearing) "special thanks" in the 1978 TOH module for inspiring its design, which is probably appropriate, since although the idea was similar the specifics are not really. 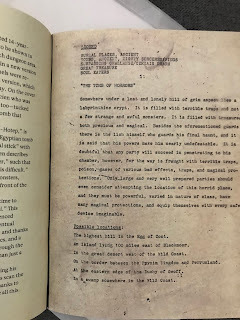 But he curiously was not given any such thanks or credit for Necropolis, even though roughly half of that adventure's tomb section is directly lifted from his dungeon. The deluxe version costs a lot more than the book version. I don't know that the TOH reproduction, even with the bonus Ra-Hotep content, justifies the price difference, but I'm still glad to have it. Is this product (either version) worth buying? That really depends on where your primary interest in D&D lies (and, of course, how much disposable income you have). 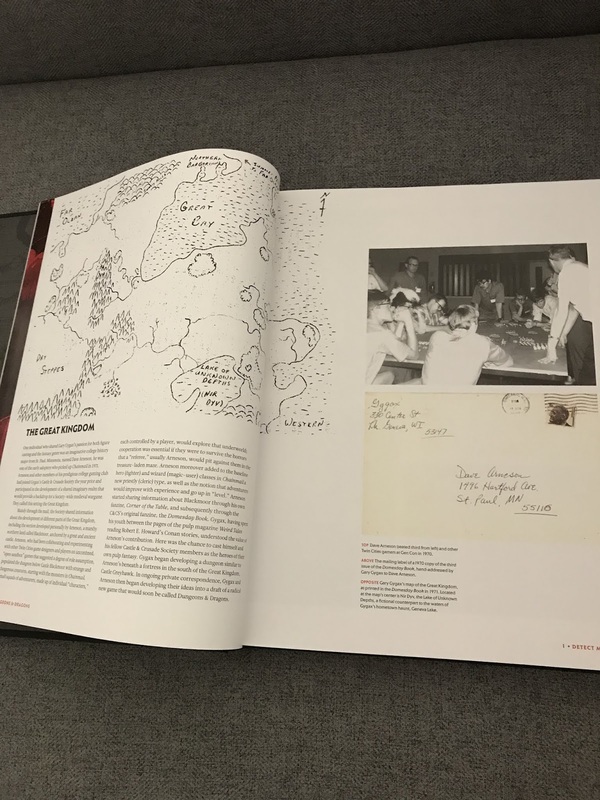 There's little if anything in this book that you will ever use directly in a game - its value is strictly historical and nostalgic and meta. 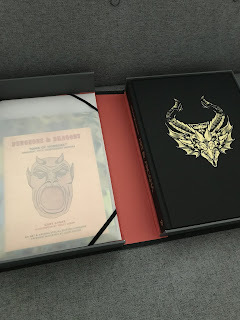 If you're interested in the history and development of D&D you also probably already know most of what's in here and have seen most of the art and maps and ads and ephemera before (and maybe even own most or all of the products). 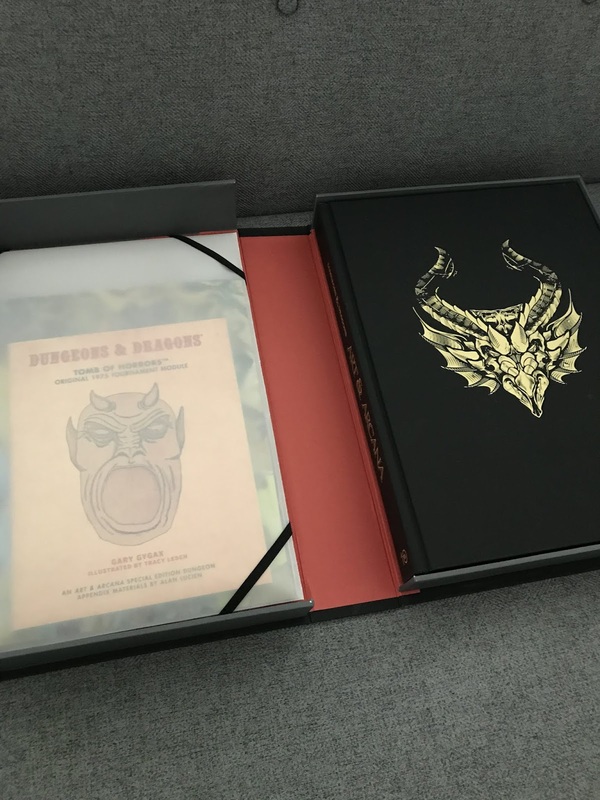 This isn't a utilitarian product by any means - it's a toy, a luxury, a way to feel like you're still connected to the D&D culture even if you haven't purchased a D&D game-book in a quarter-century or more. And, on those terms, it's a winner. 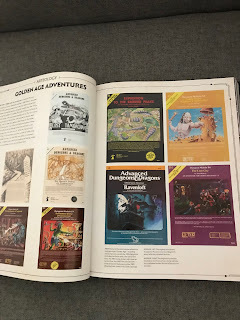 It's a very attractive, very well-produced set that will look nice on your coffee table, that you'll have fun perusing, and that might even make some of your non-gaming friends and family more interested in giving this thing a try than they would be from a dry (and, potentially musty) set of vintage rulebooks. Glad you posted about the Lucien Necropolis influence! But I disagree pretty strongly that "roughly half" of Necropolis' similar tomb is "directly lifted" from Lucien's tomb. But there just isn't much in Lucien's Tomb. No where near enough to even be 1/10th of Gygax's similar tomb, even if everything from Lucien's was reflected in Gygax's ... which it isn't. 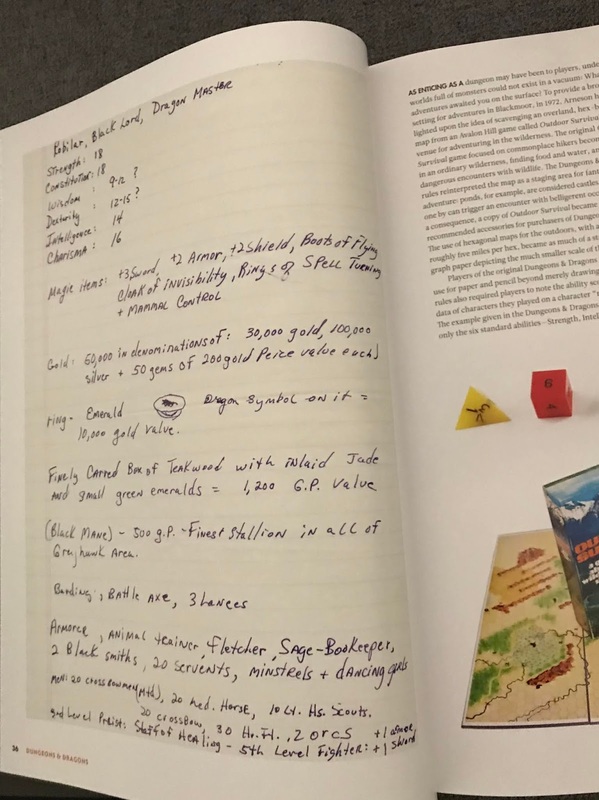 Gygax's is pages and pages of dense text—admittedly 3e vomitous stat padding, but tons more content too: Curses, different monsters, trappings, and just more detail all around. Never mind all the additional rooms Gygax added that have no inspirational correspondence to Lucien's. At least not that I can see. 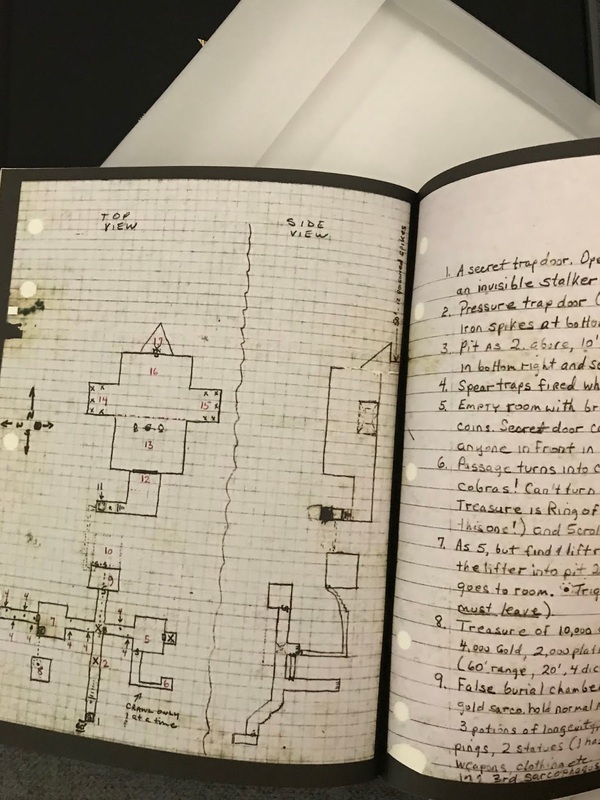 I probably exaggerated at "half," but the overlap does feel more significant to me than pagecount alone suggests because the elements that are the same are the "central route" through Gygax's dungeon - the secret door in the pit to bypass the false tomb, the hidden exit high on the wall, the trapped stairway, the large central room with the golems and mummies in the side areas (gholles and ghulaz in Gary's version) and triangular-shaped real tomb at the top - while the material he added is mostly red-herring side areas. He absolutely greatly expanded it - both in terms of adding new areas and substantially modifying and enhancing the existing areas (not the mention the 3/4 of the "Necropolis" module that isn't the Tomb) so I wouldn't by any means claim Gary stole or ripped off Lucien's dungeon, but I also don't think there's any way the similarity is just coincidental and, like I said, it surprised me that no one has ever mentioned this before. 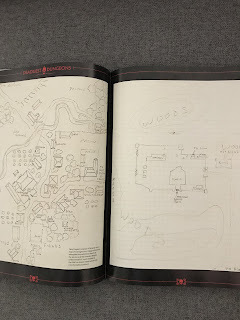 I'm not nearly as familiar with Necropolis as I could be, in part because Jon (our local DM) planned to run it at some point in his Wilderlands campaign (and may in fact have already done so some time ago, perhaps during one of my "not playing much" years). I had started to build a conversion for it back to AD&D sometime in the 1990s, but didn't get very far at the time. Necropolis is mentioned in the NIPI "Realms of Adventure" newsletter #1 by Gary as under development, and there's some bragging about its deadliness in #2 (presumably by Don Turnbull), but I don't recall seeing it in other NIPI catalogs/price lists/etc. otherwise. (Which doesn't mean that it wasn't mentioned/listed, just that I don't have that/don't remember it :D ). Necropolis was definitely planned as an NIPI release as part of their "Fantasy Master" line in 1988. 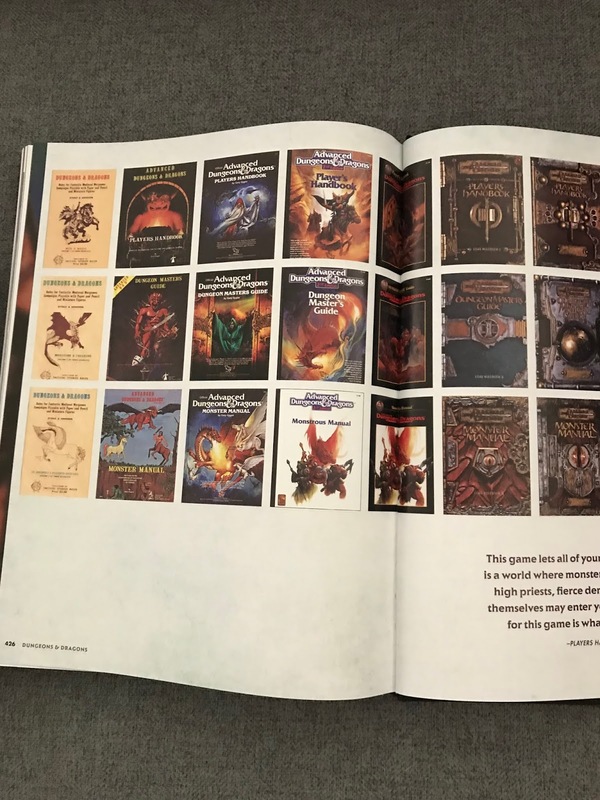 In addition to being mentioned in their newsletters, they also had a cover mock-up poster at their booth at GenCon '88 (I was very disappointed that the module itself wasn't for sale yet). Gary also talks about it a bit in Master of the Game (published in 1989). Alas, as we all know, NIPI ran out of money and it was never released in that form, which was bitterly disappointing to me since I'd played in it earlier that year and was desperate to own it. Happily, Gary revived it and converted it to the Dangerous Journeys system a few years later. Wow, jaw-dropping find Trent. I've never looked at Necropolis myself before today. It's been on my "eventual" list but it is expensive and I had trouble deciding which version to pick up. Anyway, I just found a "reference copy" (ahem) of the 3E version and agree 100%. In Necropolis (286 pages), it's only one chapter, and is greatly expanded over Lucien's (only five pages), but the core similarity is striking. The really telling detail is the top-view followed by side-view, just like in Lucien's original map. Well, that Rahotep map seems interesting. In general about the book, I don't know if I can deal with New Age D&D aesthetics anymore. I purged 1986 to 2006 straight to the trash because I didn't want to profilerate that material. The "Gene Weigel game control law"? ;) Sorry.. I just flipped through the regular version in the bookstore. Not too bad. I finally sat down and read the text (of the first 214 pages - up to 1989) over the weekend. Once it gets into the TSR era it's all pretty bland and sanitized stuff that's definitely aimed at general readers, and I even spotted a couple of minor errors (though I can't recall what they were). The only interesting new things I learned were about the OD&D artists - Keenan Powell was Gary's sister-in-law, and she, Greg Bell, and Tracy Lesch were all teenagers at the time, and were paid $2 per drawing. 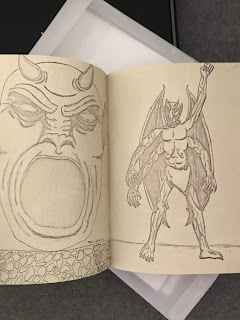 So the reason the OD&D art looks like the stuff amateur kids would doodle on the back of their school folders is because that's literally what it was. Powell's drawings were apparently received in pencil and someone had to trace over them in ink to make them printable. There's a lot of really cool pictures in this book - nostalgia-inducing images of old product art, all reproduced really nicely, and some cool never-before-published stuff like the Robilar character sheet and Hommlet and TOEE draft maps that I posted shots of above, but don't expect to really learn much from the text, or especially to have any of the famous controversies settled. 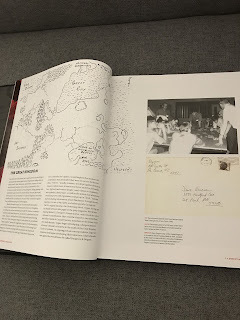 The focus of the book is almost entirely on the look of the products and TSR's art department, so an incident in 1981 when almost the entire art staff (Otus, Willingham, Dee, and maybe 1 or 2 others) got fired (or quit in protest) on the same time gets more, and more detailed, coverage than Gary's battles with both the Blumes and Lorraine Williams, or Arneson's lawsuits, all of which are mentioned only briefly in passing.